In a little noticed development at the end of March 2015, World Gold Council (WGC) member company Newcrest Mining of Australia ceased to be a member of the WGC, thereby reducing the Council’s membership from 19 to 18 gold mining companies. Newcrest Mining is one of the world’s largest gold mining companies and Australia’s largest gold miner. This exit by Newcrest Mining from the World Gold Council followed similar exits in 2014 by three other gold mining companies, namely, the very large South African gold miners Anglogold Ashanti and Goldfields, and the mid-sized Canadian gold miner IAMGOLD. These gold miner departures directly impact the World Gold Council’s annual funding because members’ dues constitute an important component of the Council’s total revenue. 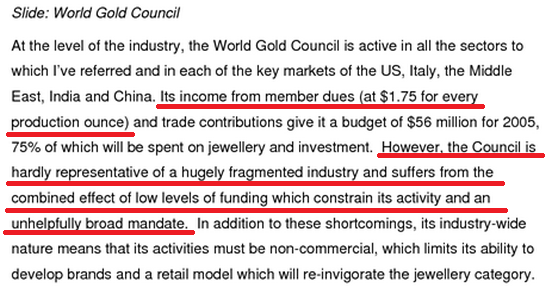 The World Gold Council’s annual revenue consists primarily of ‘Member Dues‘ and ‘Sponsor Fees‘. A third income line item, ‘Other Income’, provides a very marginal contribution to the Council’s revenue. Each gold mining member contributes a US dollar amount each year to the World Gold Council based on the number of ounces of gold produced for that year by that member. Fewer members means less revenue, or alternatively higher members’ dues for remaining members. With the combined Anglogold Ashanti, Goldfields, Newcrest and IAMGOLD producing more than 9 million ounces of gold per year in 2014 (actual production) and in 2015 (forecast guidance), the foregone member dues contributions from these former members will be a big loss to the WGC’s annual revenue, since the lost dues represent about $9 million at $1 per gold ounce members’ dues contribution, or $18 million at $2 per gold ounce contribution. The departure of Newcrest, Anglogold Ashanti, Goldfields, and IAMGOLD will undoubtedly have been concerning to the Council ‘s remaining directors of the WGC’s board and the Council’s executive management. 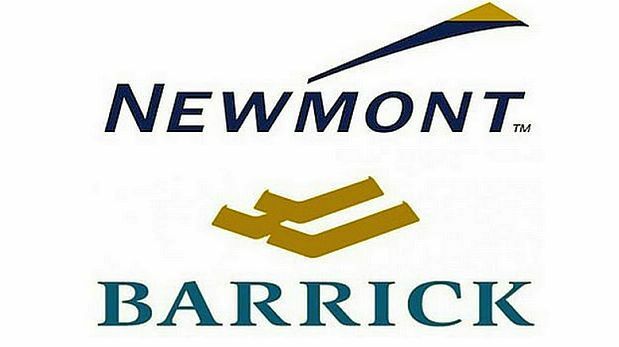 The departures also leave Barrick, Newmont, Goldcorp and Kinross as the four largest gold miner members in a World Gold Council increasingly dominated by North American, and especially Canadian, gold mining companies. The WGC’s 18 member list now reads as follows: Barrick, Newmont, Goldcorp, Kinross, Agnico Eagle, Buenaventura, Yamana, Eldorado, Alamos, China Gold, Golden Star Resources, Primero, Franco Nevada, Acacia, Royal Gold, Silver Wheaton, Newgold, Centerra. The ‘Sponsor Fees‘ revenue line item in the World Gold Council’s consolidated financial statements refers to fees earned by the WGC’s US subsidiary, World Gold Trust Services from the SPDR Gold Trust (also known as GLD due to its exchange ticker symbol). The relative size of such GLD sponsor fees is dependent on the size of the SPDR Gold Trust in any given year. With huge gold outflows from GLD over the last few years and a lower gold price (the combined effect of which shrinks assets under management in the Gold Trust), this ‘Sponsor Fees’ revenue stream, which is 0.15% of the GLD adjusted net asset value (ANAV), has plummeted. The same is true for the Marketing Agent fees earned by the GLD marketing agent, State Street Global Advisors. In total, these two fees are a combined 0.30% of GLD’s ANAV. More than 640 tonnes of gold have been withdrawn from the GLD since gold holdings of the Trust peaked at 1353 tonnes in December 2012. 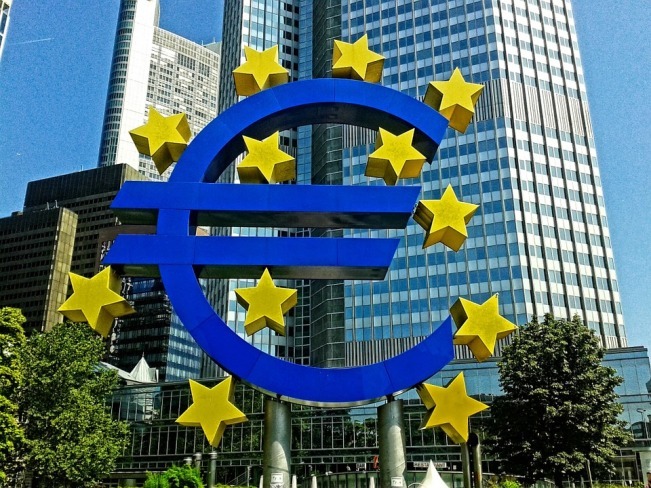 It’s notable that, as of early June 2015, the SPDR Gold Trust has just dropped out of the worldwide top 10 ETFs list by size, a list that at one time the GLD occupied top place in. In another little noticed, but critical, development at the end of February 2015, the World Gold Council’s 100% owned U.S. subsidiary World Gold Trust Services successfully attained (after persistent consent solicitations and consent solicitation adjournments) a majority (51%) of SPDR Gold Trust consent votes so as to amend GLD’s trust indenture to a) increase the sponsor fee from 0.15% per annum to 0.40% per annum, and b) to be permitted to compensate the World Gold Council and its affiliates for the provision of marketing and other services to the SPDR Gold Trust. 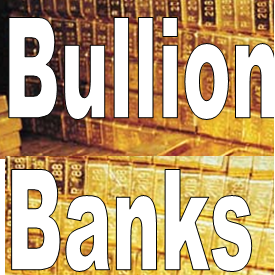 When these GLD trust indenture changes are implemented by the SPDR Gold Trust in the near future, it will centralise the payment and disbursement of all GLD marketing agent fees, all GLD trustee fees and all GLD custodian fees to World Gold Trust Services (in addition to the existing ‘Sponsor’ fee), thereby allowing the World Gold Trust Services to revisit the current marketing agent fee arrangement with State Street Global Advisors, while also allowing an increase in the employment of the World Gold Council in the provision of GLD marketing services. These trust indenture changes look primarily to be a revenue generating tactic by the World Gold Council to re-route a larger portion of a shrinking GLD fee pie to itself. Since the emergence of the SPDR Gold Trust as one of the world’s largest ETFs, sponsor Fees from the GLD account for a far larger share of World Gold Council revenue than Member Dues, despite the World Gold Council still being widely known as a ‘miner funded’ association. Sponsor fees to World Gold Trust Services (i.e. to the World Gold Council) were $93.8 million in 2011 and a whopping $104 million in 2012, allowing 2012 WGC revenues to reach $169 million. Sponsor fees then dropped by 31% in 2013 to $71.5 million, and plummeted further to less than $48 million in 2014. See table 1 below for 2010-2013 data and see separate section below for 2014 calculations. From 2010 to 2013, the revenue contribution from GLD Sponsor Fees dominated the revenue contribution from WGC member dues, with Sponsor fees running at 55% of total revenue in 2011, 70% in 2011, 61.5% in 2012 and 69% in 2013. This mix of sponsor fees versus member dues clearly illustrates why the WGC now refers to itself as a commercially driven organisation, as you will see below. It also demonstrates that, in contrast to having diversified revenue streams, the annual revenue of the World Gold Council looks like a one trick GLD pony, or perhaps a two trick GLD and miner pony. The World Gold Council has not yet published its consolidated financial statements for 2014, however, the Council’s 2014 revenues from the SPDR Gold Trust can be calculated from the GLD regulatory filings which are available on the SEC EDGAR database website. Likewise, the World Gold Council’s projected revenue from gold miner member dues can be calculated under various scenarios and assumptions. See below. In 2013, World Gold Council assets totalled $231.7 million (2012 total assets $296.8 million). In 2013, WGC revenues totalled $103 million (2012 revenues $169 million). By any standards, these assets and revenue totals continue to be substantial, despite the drop in both assets and revenues between 2012 and 2013. However, with member departures in 2014-15 and reduced commercial earnings from the GLD, the question becomes, in light of the low US dollar gold price environment, are the WGC’s revenue streams, and in turn, the WGC’s sizable annual expenditure sustainable without dipping into reserve cash funds and investments? A discussion of this question requires an in-depth understanding of how the WGC’s revenue is generated and how the Council is funded, which in turn requires an understanding of how the World Gold Council is structured. 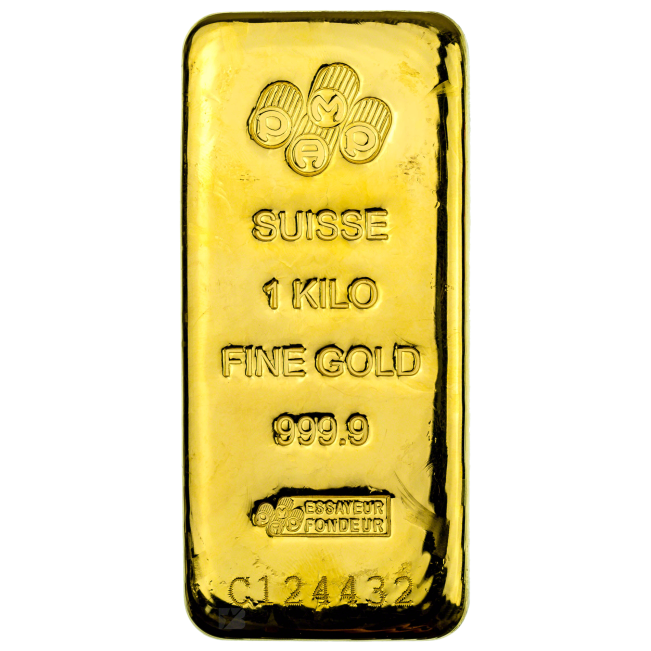 The World Gold Council (WGC) is registered as a Swiss ‘Association’ (or Verein) under the commercial register of the Canton of Geneva (officially, the Republic and Canton of Geneva). See Swiss Registre Du Commerce (Federal Commercial Registry Office) extract for the WGC here -> WGC Extrait. The WGC’s company numbers are CH-660-0534987-6 and (IDE/UID) CHE-106.151.454. Numerous organisations established in Switzerland are structured as associations, such as the notorious FIFA, which is registered in Zürich (company number CHE-107.301.064). Coincidentally, both the WGC and FIFA employ KPMG Switzerland as their auditors. A Swiss association comprises members, and in the case of the WGC, the members are its member gold mining companies from around the world. Member firms of a Swiss association control the assets and earnings of the association, so this was probably why the World Gold Council choose such a structure. Since 1987, the only amendment to the original Article 1 has been a change in wording to state that the Association “shall have it’s principal offices at such locations as the board of directors may determine from time to time” i.e. not in Geneva. While the Articles of Association describes the Council as a ‘non-profit association‘, this does not mean that the WGC doesn’t strive to make a profit. Many associations, industry associations or otherwise, do make a profit; they just can’t distribute the profit in the normal way a corporation can. However, the WGC does have a draw-down facility for its members that can be used where profits have been created by a liquidity event such as a sale of assets or investments. As recently as 2005, the WGC was still being referred to by one of its members as a non-commercial organisation. This reference was made by Anglogold Ashanti. See section below. 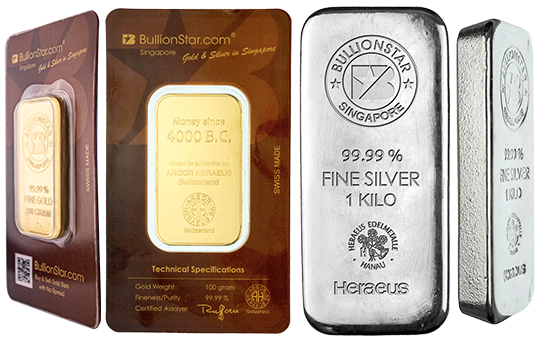 Currently, on its website, the WGC describes itself as “the market development organisation for the gold industry“, with aims to “stimulate demand, develop innovative uses of gold and take new products to market.” On a sectoral basis, the WGC focuses on gold mining supply, and demand across the jewellery, technology, investment, and central bank reserve asset management sectors. Although the registered office of the WGC is in Geneva, the WGC’s head office is now in London, and has been for a long time. As the WGC financial statements say, “the WGC’s principal place of business is London“. Under the Registrar of Companies (England and Wales), the World Gold Council is registered as an overseas company, specifically, a non-profit association under Swiss Civil Code Article 60, foreign company number FC014324, with a registered office in Geneva. The Council is also registered as a UK establishment company with a company number of BR012707. The WGC maintains offices in 8 other cities around the world apart from London, namely, New York, Hong Kong, Shanghai, Beijing, Singapore, Tokyo, Mumbai, and Chennai. Note that the offices are all either in large global financial centers or else in large cities within the largest gold consuming nations. World Gold Council offices previously maintained in Dubai, Istanbul, Cairo and Jeddah were closed in 2011. Note that the usage of the name ‘World Gold Council’ as applied by the WGC itself can refer to ‘The World Gold Council, An Association and it’s subsidiaries or affiliates ( together or alone “World Gold Council”)‘. The WGC has approximately 20 fully owned subsidiaries, the most important of which (from a revenue generating perspective) is the US-based fully-owned subsidiary World Gold Trust Services LLC (WGTS) which earns the sponsor fees on the SPDR Gold Trust (GLD). World Gold Trust Services LLC, is a Delaware registered company, incorporated on 17 July 2002, with Delaware company number 3548735. See here for the original Certificate of Formation of WGTS, here for amended and restated LLC agreement of WGTS (the sole member of which was the World Gold Council), and here for the original funding agreement between the WGC and WGTS dated October 2004. 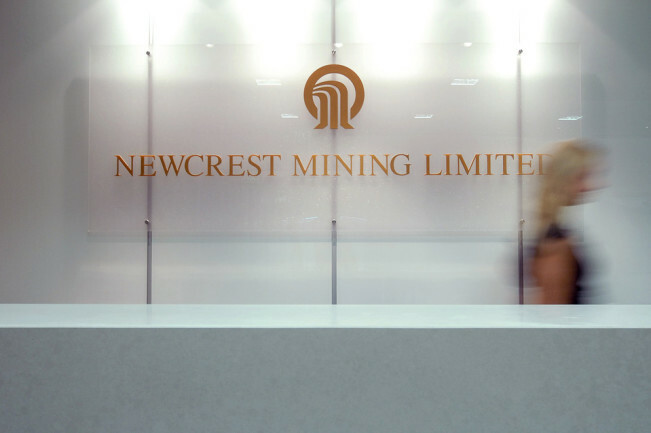 “Headquartered in Australia, Newcrest Mining is a gold producer with mining operations in Australia, Papua New Guinea, and Indonesia and in Cote d’Ivoire in West Africa. The company has a global workforce of over 19,000 people. I then emailed Newcrest Mining investor relations / communications asking for confirmation as to whether Newcrest had left the World Gold Council, and if so, the rationale for leaving. Newcrest did not reply to my email. I then emailed the World Gold Council. My query about Newcrest to the World Gold Council was part of an email with a number of other questions, some of which the WGC media team did reply to, and some of which, including the Newcrest question, they chose not to answer. Another source confirming the Newcrest Mining departure from the WGC is the Newcrest web site itself, and its Internet Archive imprints. On the Newcrest website under the board of directors’ biographies, as late as 12th April 2015, Newcrest CEO Sandeep Biswas was still listed as a director of the World Gold Council, while Newcrest CFO Gerard Bond was still listed as an alternate director of the Council. These bios listings were then amended during April to delete the references to NewCrest’s directorships on the board of the World Gold Council. See the current Newcrest board of directors web page here. Anglogold Ashanti and Goldfields, the two South African gold mining companies, both departed from the World Gold Council circa June 2014. Anglogold Ashanti and Goldfields were both listed as members on 17th May 2014 (when the total membership was 21), then Anglogold Ashanti and GoldFields had both departed from the World Gold Council by late June 2014, but Silver Wheaton had joined, so the total membership suffered a net reduction of one member and became 20. Despite the name, Silver Wheaton sources both gold and silver, via precious metal revenue streaming, not directly by mining. 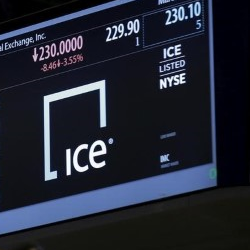 “We have left the WGC, which is part of our broader focus on costs,” AngloGold Ashanti senior VP for investor relations and group communications Stewart Bailey confirmed. “The reason for Gold Fields’ departure from the WGC was purely a cost decision,” Gold Fields spokesperson Willie Jacobsz said in an email. By November 2014, Canadian gold miner IAMGOLD had also departed the Council, bringing the total membership down to 19. Therefore, within 10 months of each other, 4 gold miners, 3 of which are major players worldwide and one of which is a mid-sized player, departed from an organisation whose aim is to promote the potential of gold globally and to increase demand for gold worldwide. Ironically, in respect of the World Gold Council’s effectiveness or lack thereof in boosting the gold price (which it claims is not its raison d’être), at least 3 of these gold miners (and probably Newcrest also) departed from the Council because they needed to save money in an environment of a sustained downtrend in the US dollar gold price. Any World Gold Council member gold mining company that wishes to terminate its membership of the WGC needs to give the WGC 6 months’ notice of such departure, as per the WGC’s Articles of Association. Therefore, South African miners Anglogold Ashanti and Goldfields would have given notice termination to the WGC in about December 2013. 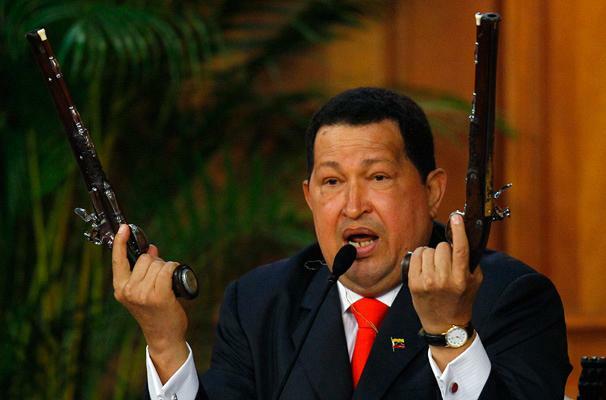 Canadian miner IAMGOLD would have given termination notice in about May 2014. And finally, Newcrest Mining of Australia, which lapsed it’s WGC membership at the end of March 2015, would have needed to give termination notice to the WGC in late September 2014. See below for the relevant clause of Article II of the WGC’s Articles of Association on termination of membership. As recently as October 2013, the World Gold Council had 23 members, specifically 18 full members and 5 ‘Associate’ members. These 5 associate members were Franco-Nevada, Hutti Gold Mines, Royal Gold, China Gold, and Mitsubishi Materials Corp. Full members were known as Category A members in the Articles of Association, while Associates were known as Category B members. WGC then abolished the associate member category in 2013. By mid November 2013, four of these five associate members had transferred to full membership and the Council then had 22 full members and no associate members. At the same time (October – November 2013), Indian gold mining company Hutti Gold Mines ceased to be listed as a member. Mitsubishi Materials Corp then departed the member list in the first week of January 2014, bringing the total membership down to 21 members. And as explained above, then Anglogold Ashanti, Goldfields, IAMGOLD, and Newcrest Mining all departed and Silver Wheaton joined. Going back even further to April 2012, membership of the WGC totalled 24 companies with Coeur d’Alene Mines also a member. 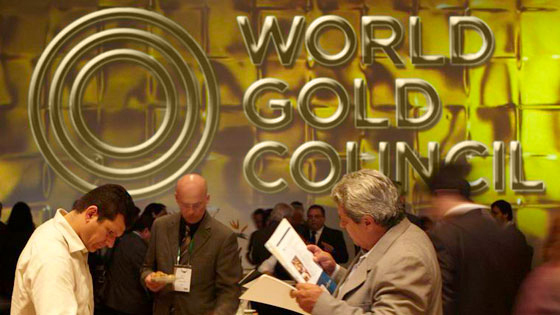 The current role call of the membership list of the World Gold Council (18 members) now reads as follows: Barrick, Newmont, Goldcorp, Kinross, Agnico Eagle, Alamos Gold, China Gold, Golden Star Resources, Primero, Eldorado Gold, Franco Nevada, Acacia, Yamana Gold, Royal Gold, Silver Wheaton, Newgold, Centerra Gold, Buenaventura. Note that Acacia was formerly known as African Barrick Gold. Of the current 18 members, Barrick, Newmont, Goldcorp and Kinross (in that order) have the largest annual production and are 1st, 2nd, 4th and 5th in the current worldwide top 10 gold producers list . 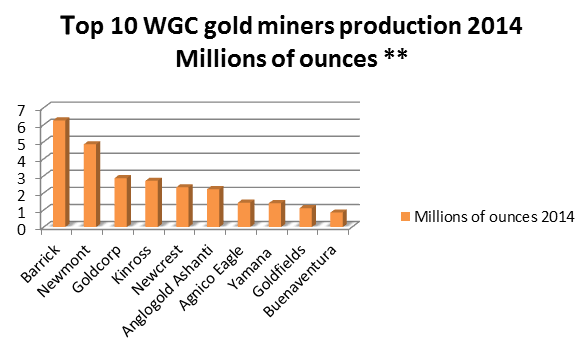 Anglogold Ashanti, GoldFields, and Newcrest, were numbers 3, 6 and 7 on the same list, so their departure from the WGC is a significant blow to the World Gold Council’s members’ dues revenues, which, as explained below, are calculated based on ounces of gold production, billed every three months, and these four gold miners produce more than 9 million ounces of gold per annum. 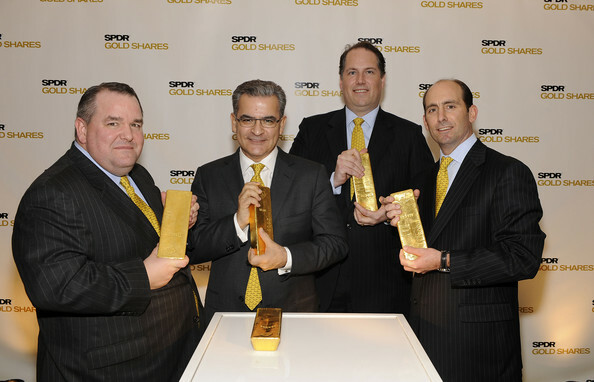 Additionally, the SPDR Gold Trust filings on the SEC Edgar website are essential sources for understanding the sponsor fees generated by GLD, which generate revenue for World Gold Trust Services, and the revenue of which in turn is passed through to the World Gold Council and appears in its consolidated financial statements. These GLD filings also shine a light on the World Gold Trust Services’s persistent attempts (ultimately successful) to amend the SPDR Gold Trust “trust indenture” so as to centralise the payment of the marketing agent fee, the trustee fee, the custodian fee and the sponsor fee to World Gold Trust Services. I asked the World Gold Council on numerous occasions and through numerous channels as to when it’s 2014 consolidated financial statements would be published, but they declined to answer. The 2014 WGC accounts have to be approved by the WGC board of directors prior to the WGC AGM, so if the AGM has not yet taken place, this could suggest that the 2014 consolidated financial accounts have not been approved. If the AGM has taken place (which I could not ascertain), then the delay in publishing the 2014 financial statements must be for some other reason. Coincidentally, the Chief Financial Officers of both the World Gold Council and it’s US subsidiary World Gold Trust Services have departed recently. The Council’s executive team web page still listed Robin Lee as World Gold Council CFO as recently as 15th March 2015 (but not the week after), although Lee’s LinkedIn profile lists his tenure at the WGC as ending in 2014. Emails to Lee’s WGC address currently respond with the message “Please email Sidney Chan, the new CFO, on all CFO matters“. An email I sent to Sidney Chan about the 2014 financial accounts went unanswered. According to the most filing on the Swiss registry, the authorised signatories for the WGC are still the President, Randall Oliphant, the CEO, Aram Shishmanian, the CFO, Robin Lee, and KPMG SA of Geneva. Adrian Pound’s LinkedIn profile currently (as of early June 2015) states “Actively seeking new opportunities“. It’s quite unusual for the 2 CFOs who were most responsible for the WGC 2014 financial statements to both now be gone from the employment of the World Gold Council old Trust Services, and the 2014 accounts have still not been published. 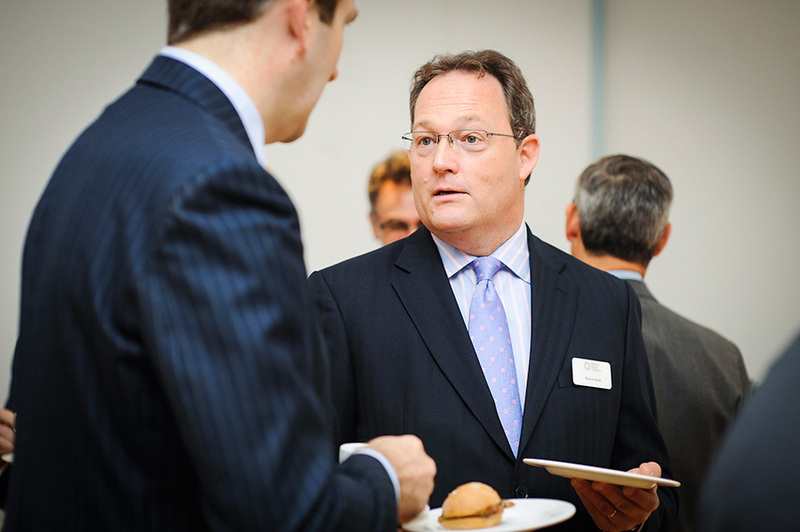 Additionally, on 31 July 2014, World Gold Trust Services CEO Kevin Feldman also resigned. This was just over one month after WGTS began its consent solicitation campaign with GLD Shareholders to change the Trust Indenture to the benefit of WGTS and the World Gold Council. It’s not clear from Kevin Feldmand’s LinkedIn profile as to what he is doing now. 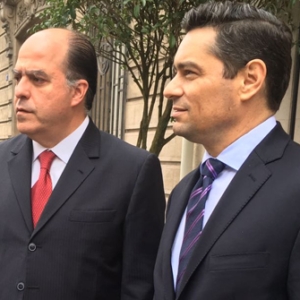 After Kevin Feldman resigned, Aram Shishmanian, CEO of the World Gold Council, was appointed as acting CEO of WGTS on 31 July 2014 and remained as acting CEO until 8 September 2014, at which point William Rhind was appointed as CEO of WGTS. The annual membership ‘dues’, or fees, that the member gold mining companies pay to the World Gold Council can fluctuate widely each year. These member dues totalled $56.4 million in 2010, but only $36 million in 2011. Likewise, members’ dues totalled $60.2 million in 2012, but in 2013 were just under half of the 2012 figure, reaching only $28.2 million. Although the number of members in any given year will have an impact on total members’ dues revenue, the wide fluctuations in annual member dues shows that the per member annual fee itself (which can fluctuate each year) is the most important determinant in the equation. Another important consideration is that, in an organisation which had more than 20 members in each of the years’ 2010-2013, the “Top 10” members’ dues in all of those years accounted for over 90% of all members dues, which illustrates the critical importance of the large gold miners to the funding of the World Gold Council. In April (2015), I emailed the WGC and asked how it’s member dues were calculated and whether it was based on a metric such as ounces of gold produced by each company each year, size of gold reserves of each company, market cap of each company or some other way. In other words, was it based on a formula? 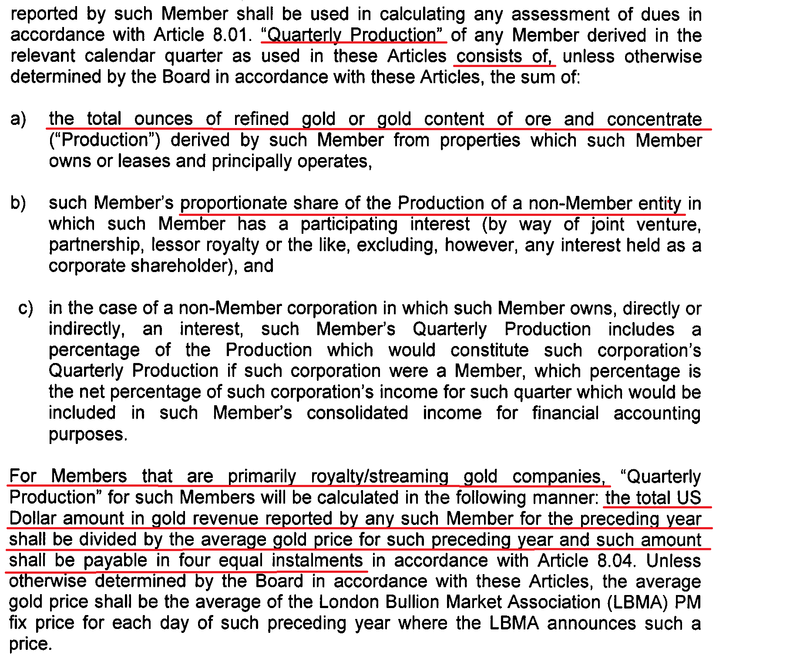 In its statement “How fees are allocated is a private business decision”, the WGC must be referring purely to member dues (which it here called member fees), because the Sponsor ‘fees’ charged by World Gold Trust Services to the SPDR Gold Trust are not a private business decision, they are publicly specified in the Trust Indenture and Prospectus of the SPDR Gold Trust, and also in the numerous SEC filings that GLD makes multiple times per year. The SPDR Gold Trust sponsor fee is currently 0.15% per annum. The members’ dues allocation is not really a private business decision, it’s more of a goal-seek using a simple formula and a budget projection of revenues and expenditures, taking into account GLD sponsor fees. Since the WGC media team response did not provide much useful information nor refer me to any useful data sources, we need to turn to the WGC consolidated financial statements, and the Articles of Association, and the GLD filings, which all do provide a lot of useful answers. It turns out that the members’ dues are based on the annual gold production of each member, based on quarterly production summaries submitted to the WGC by each member. It would have been very easy for the World Gold Council to explain this to me, but they chose not to for whatever reason. In the Notes to the 2013 consolidated financial statements, section 19 “Related party transactions” it states that in 2013, the year in which total members dues were $28.24 million, the Top 10 members’ dues totalled $26 million, representing 92.10% of total members’ dues. (the 2012 figures were total members’ dues of $60.18 million, with the top 10 members contributing $55 million, representing 91.45% of total member’s dues). The WGC Articles of Association, specifically , Article VIII ‘Dues’, provides in-depth information on how the member dues are calculated. Article VIII explains how each member’s dues are calculated using a formula based on quarterly gold production multiplied by X US dollars per ounce (where X seems to be at least >= 1). After every quarter, each member is expected to report its quarterly gold production to the WGC as soon as practicable. Quarterly production consists of either “ounces of refined gold” or “gold content of ore and concentrate” primarily under the operational control of that member, and then various other proportions for other operations in which that member may have an interest etc etc. Because gold royalty/streaming companies are now also members of the WGC, i.e. Royal Gold, Silver Wheaton and Franco Nevada, the Articles of Association (2013 version) also addresses how the member dues of such companies are calculated. The formula for the member dues of a royalty/streaming company is simply that company’s annual US dollar revenue divided by the average gold price for the previous year, payable in 4 installments. So that’s $1 per ounce of gold. For example, if a royalty company had $300 million in revenue, and the average gold price was $1200 during the year, the member’s dues to the WGC would be $300m / $1200 = $250,000. Before the ‘Associate’ member category was discontinued in 2013, the WGC charged ‘Reduced Dues’ or ‘Associate Dues’ to associates (category B members), as opposed to ‘Regular Dues’ for Full members (Category A members). These “associate dues” were specified as “a fixed annual fee in US dollars”, and not a per ounce dollar amount. An Anglogold Ashanti presentation from 2005 (when Anglogold Ashanti was a WGC member) said that the World Gold Council’s “income from member dues” was “$1.75 for every production ounce.” The same 2005 presentation also pointed to some of the limitations of the WGC such as it being non-representative, suffering from funding constraints, and also as being “non-commercial“. As to when the World Gold Council went from being non-commerical to ‘commercially driven’ is not clear, but it seems to have been somewhere between 2005 and 2008, as the GLD became more important to total revenues. We now know that the World Gold Council uses a simple ‘US dollar per ounce of gold production‘ formula when setting annual members’ dues, and that it can be a round figure dollar amount such as $1 or $2 per ounce, and also can be a dollar and cent amount such as $1.75 per ounce. Let’s take a quick look at annual gold production figures for 2013 using the top 10 gold miners as a proxy to see how closely they fit in with this formula. Members’ dues were $28.24 million in 2013, with the top 10 members contributing $26 million, or 92% of the total. A February 2015 article by Mining.com provides estimated annual gold production statistics for the” world’s top 10 gold producers” in 2013 and 2014. With Moz = millions of troy ounces, in 2013 Barrick produced 7.17 Mozs of gold, Newmont 5.07 Moz, AngloGold Ashanti 4.11 Moz. Goldcorp 2.67 Moz, Kinross 2.63 Moz, Newcrest Mining 2.36 Moz, Gold Fields 2.02 Moz, Polyus Gold International (Russian miner) 1.65 Moz, Sibanye Gold Limited (South African) which split from Gold Fields in February 2013 mined 1.43 Moz, and in 10th position was Agnico Eagle Mines Ltd with 1.1 Moz. 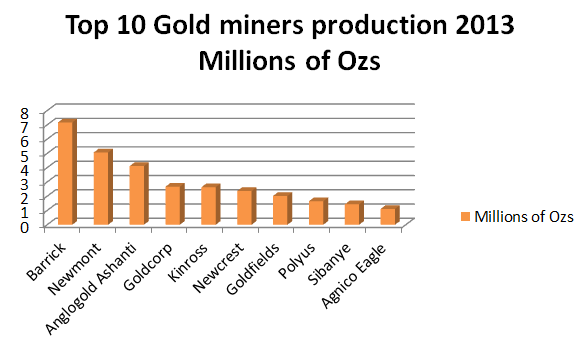 These 10 miners produced 30.22 Moz of gold in 2013. Excluding WGC non-members Polyus and Sibanye, the production figure was 27.14 Moz. Excluding Agnico Eagle (which mined 1.1 Moz), the top 7 produced 26.03 Moz. So, it looks like the World Gold Council charged its members a subscription dues of about $1 per ounce of gold production in 2013. Let’s call it a round $1 per ounce. You could add back Agnico Eagle and a few other miners such as Yamana and Buenaventura to arrive at 28 Moz. This would account for the 2013 members’ dues of $28.24 million, so the real fee might be a few cents less than a dollar. However, a dollar is roughly in the ballpark of what the members’ dues charge looked to be, and its easy to conceptualise. 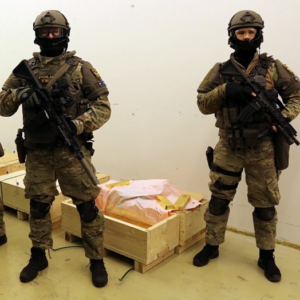 This would also suggest that in 2012, when members’ dues totalled $60.17 million, that the World Gold Council charged its members $2 per ounce of gold produced or thereabouts. 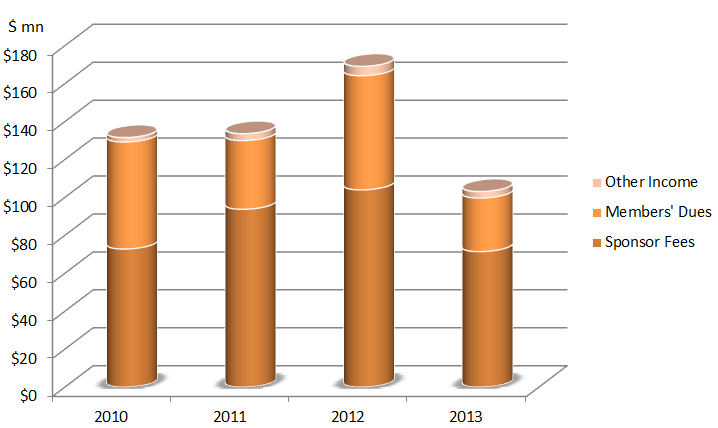 GFMS published slightly different top 10 gold miner production figures to Mining.com for 2013 production. The GFMS 2013 data in tonnes, via Mineweb was: Barrick 222. 9, Newmont 157.5, Anglogold 127.7, Goldcorp 82.9, Kinross, 77.7, Navoi (Uzbek) 70.5, Newcrest, 73.5, Goldfields 58.1, Polyus 51.3, Sibanye 44.5 tonnes. 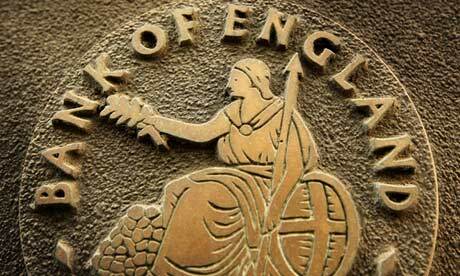 These tonnes figures, when converted to ounces, gives a total of 31,076,190 ozs, or 31.1 Moz. Excluding Polyus, Sibanye, and Navoi, then the Top 7 producers, who were all members of the WGC in 2013, produced 25.8 Moz in 2013. So, these GFMS figures also support the assumption that the WGC charged its members a member dues of about $1 per ounce in 2013. Similarly, in 2011, it looks like members contributed about $1 per ounce of production or a little more (using figures from Mining.com), and possibly an amount between $1.66 and $1.75 per ounce in 2010. Therefore, although 2014 World Gold Council financial statements not yet published, it’s still possible to project the contribution of members’ dues to total WGC revenue, using 2014 gold production statistics and assumptions of various dollar contributions per ounce as member dues. Again using Mining.com provided data, in 2014, Barrick reported 6.25 Moz in gold production, Newmont 4.85 Moz, AngloGold Ashanti 4.44 Moz, Goldcorp 2.87 Moz, Kinross 2.71 Moz, Newcrest Mining 2.33 Moz, Gold Fields produced 2.22 Moz, Polyus Gold 1.7 Moz, Sibanye Gold 1.59 Moz, and in 10th position Agnico Eagle with 1.43 Moz. Let’s assume that the date on which Anglo Gold Ashanti and Gold Fields departed from the World Gold Council was 30 June 2014, so only half their 2014 production can be included (They departed sometime in May or June according to the WGC web site). Excluding non-members of the WGC, Polyus and Sibanye, and also excluding half of the 2014 production of Anglogold Ashanti and Goldfields, gives a total gold production from the above eight miners of 23.77 Moz. 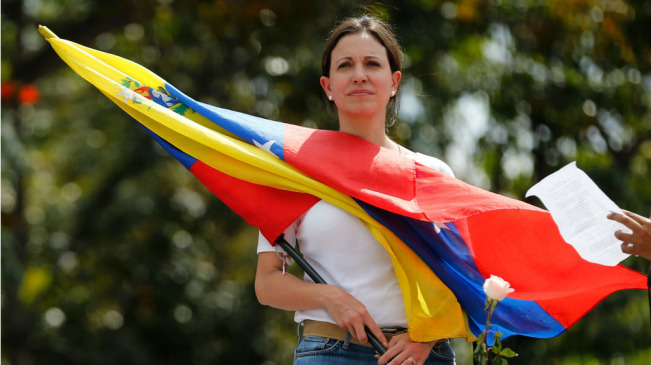 Add in two other World Gold Council companies to bring the list back to ten miners. In this case, I add in Yamana, which reported 2014 production of 1.4 Moz, and Buenaventura with 0.85 Moz in 2014, so in total, this top 10 list would represent about 26 million ounces. 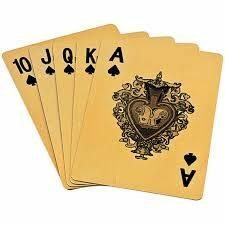 The list of gold producers outside the worldwide Top 10 includes many gold mining companies who are not members of the World Gold Council, and some who are not purely or primarily gold miners. Therefore, the drawback with a published top 20 list of miners that produce gold, such as one by Mineweb here, is that many miners on the top 20 list from positions 8 up to 20, such as Navio, Polyus, Sibanye, Randgold, Harmony, Shandong, and China National Gold are not members of the World Gold Council, and some listees such as Freeport and Glencore are not primarily gold miners. The only two that make the 8-20 positions ranking, and that are also WGC members, are Agnico Eagle and Yamana. According to Mineweb’s Top 20 list for 2014, World Gold Council member listees (including Anglogold Ashanti, GoldFields, and Newcrest) produced 874 tonnes (28.1 Mozs) of the Top 20’s total 1311 tonnes production, or 66% of the Top 20 total. Excluding Anglogold Ashanti, GoldFields, and Newcrest, the remaining Top 20 miners that are also World Gold Council members produced 595 tonnes (19.13 Mozs), or 45%, of the 2014 top 20 total. 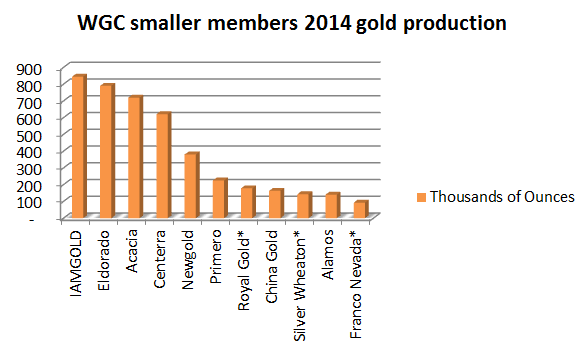 So, the WGC now only represents less than half of the Top 20 gold producers (by ounces produced). Since this worldwide top 20 list is problematic to an analysis of the WGC, a top 20 list (or all 21) that comprised WGC members in 2014, has to be reconstructed. Beyond Agnico Eagle and Yamama (and Buenaventura), some other WCG members such as 2014 member IAMGOLD with 844,000 ozs, and current member Eldorado Gold with 790,000 ozs, also produced reasonable amounts of gold in 2014. IAMGOLD (844,000 ozs), Eldorado (790,000 ozs), Acacia (719,000 ozs), Centerra (621,000 ozs), Newgold (380,000 ozs), Primero (225,000 ozs), Royal Gold* (178,000 ozs), China Gold (163,443 ozs), Silver Wheaton* (142,800 ozs), Alamos (140,500 pzs), Franco Nevada* (92,774 ozs). These production figures were sourced on company websites, company results presentations and end-of-year financial reports, but are listed here purely as indicative figures. 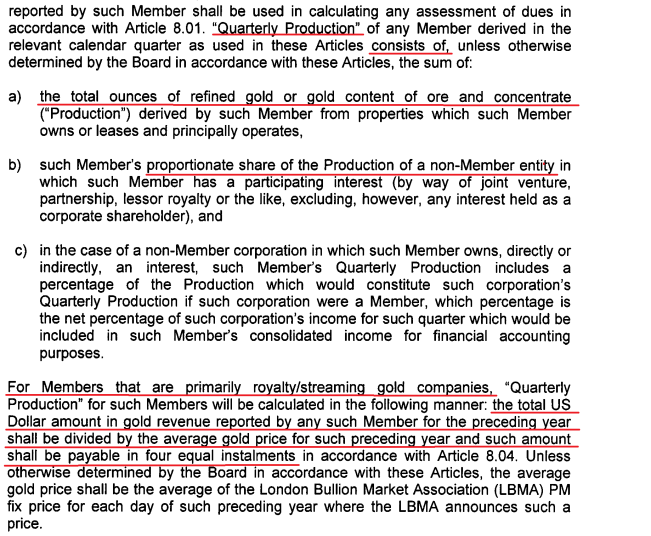 Note also that * = Royalty company or Streamer company, and the ounces figures listed for these companies are for gold equivalent ounces (GEOs) or similar, and haven’t been cross-referenced with other sources. 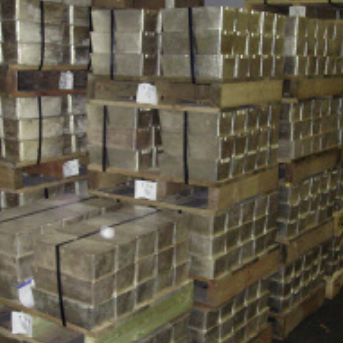 So in total, the members of the WGC members still produced just over 30 million ounces of gold in 2014. Newcrest still contributed a full year in 2014, and the assumption is that Anglogold Ashanti and Goldfields still contributed about half a year. The impact on member dues will become more apparent for 2015 revenue. Even though Anglogold Ashanti and Goldfields left in 2014, some of the smaller members have now increased production, and the top 10 members now look as if they are contributing about 86%-87% of total member dues. At $1 per ounce, member dues for 2014 would be about $30 million. It would be logical for variable members’ dues for a forthcoming year to be set towards the end of the preceding year. With 2013 sponsor fees from the SPDR Gold Trust well down on 2012 due to gold outflows from the GLD and a lower gold price, the World Gold Council board would probably have decided that member dues should increase for 2014. Therefore a more realistic members’ dues for 2014 would be $2 per ounce or even higher. 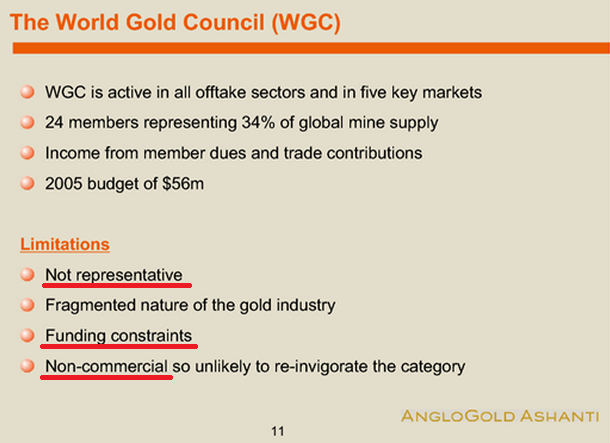 Given that both Alglogold Ashanti and Goldfields both exited from the World Gold Council around June 2014, this would suggest they informed the WGC of their intention to leave in about November/December 2013. 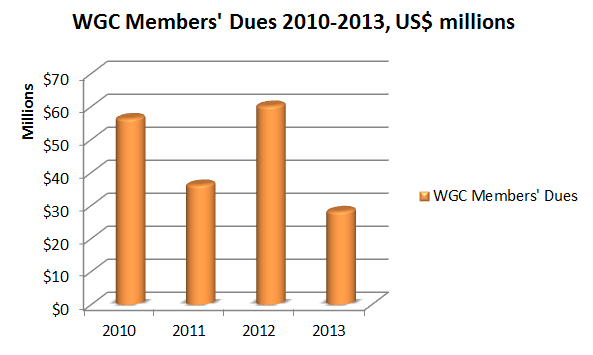 November/December 2013 may have been the time at which the WGC informed members of revised members dues for the year 2014. And since Anglogold and Goldfields decided to leave, because of a need to save costs, it would be logical to assume that the 2014 member dues were higher than in 2013, and possibly high enough that an increase in members’ dues forced the South Africans to balk and walk away. This would suggest a 2014 contribution per ounce of gold produced of $2 or $2.50 and maybe, but less likely, as high as $3 per ounce. Interestingly, for Q1 2015, Newcrest Mining increased gold production to 610,186 ozs, from 577,110 oz in Q4 2014, so on an annualised basis, Newcrest may produce about 2,440,000 ozs in 2015. With Newcrest Mining having exited from the WGC at the end of Q1 2015, this substantial member’s dues will also be missing from the 2015 revenue numbers, as will the 2.2 million projected 2015 ounces from Goldfields, the 4.0 million – 4.3 million ounce 2015 guidance for Anglogold Ashanti, and the 820,000 – 860,000 ounce 2015 guidance from IAMGOLD. In total, somewhere between 9.46 million – 9.80 million ounces of gold production that otherwise would be factored into WGC 2015 revenues will now be missing. At $2 per ounce, this is nearly $20 million, and starts to look like quite a big hit for the WGC’s annual budget to take. Between 2010 and 2013, the majority of the World Gold Council’s revenue was earned via ‘Sponsor fees’ accruing to the Council’s fully owned US subsidiary World Gold Trust Services LLC (WGTS) in return for acting as ‘Sponsor’ to the SPDR Gold Trust. 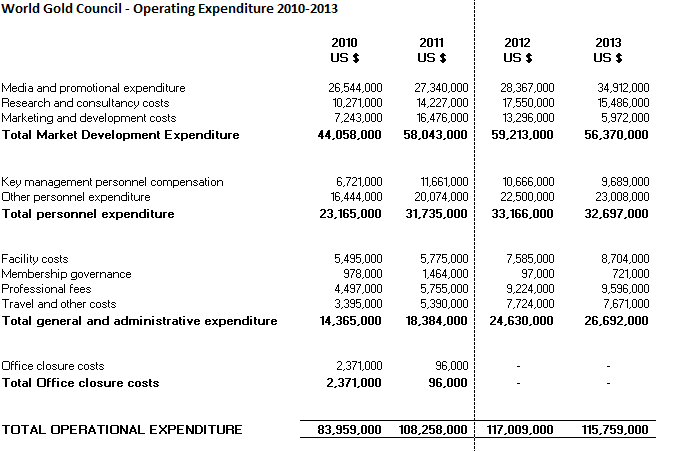 These sponsor fees were 55% of World Gold Council total revenue in 2011, 70% in 2011, 61.5% in 2012 and 69% in 2013. A board of directors was established for WGTS in January 2013. According to Reuters, the members of the board of directors of WGTS are William Rhind, the WGTS CEO, William Shea, chairman of the board, Aram Shishmanian, CEO of the World Gold Council, and also two other directors Neal Wolkoff and Roco Magiotto. 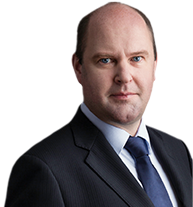 Andrian Pound, the ex CFO, was also listed as a member of the board when the director list was drawn up by Reuters. Within the SPDR Gold Trust (GLD) structure, the sponsor fee is payable monthly in arrears to World Gold Trust Services and is currently accrued daily at an annual rate equal to 0.15% of the adjusted net asset value (ANAV) of the Trust. The sponsor fee that World Gold Trust Services will earn will soon change to 0.40% per annum – see discussion below on the recent GLD consent solicitation. Because the sponsor fee in the GLD is specified as a percentage of the Trust’s asset value, as the asset value of the Trust increases, the sponsor fee naturally increases. Conversely, as the asset value shrinks, the sponsor fee does likewise. Looking at historical GLD holdings data (see spreadsheet xls link on webpage here), the amount of gold held in the SPDR Gold Trust rose sharply between 2006 and 2010. From a daily average gold holding of 372 tonnes during 2006, the daily average gold holding increased to 499 tonnes during 2007, 669 tonnes in 2008, 1068 tonnes in 2009, and 1233 tonnes in 2010. This 1200+ tonne average daily gold holding in the Trust was maintained in 2011 and 2012, at 1238 tonnes and 1244 tonnes, respectively. Therefore, on the back of very strong growth in the asset value of GLD in the years up to and including 2012, the sponsor fees earned by the World Gold Council (via its subsidiary WGTS), also grew strongly. This direct “GLD Asset Value ~ Sponsor Fee” relationship allowed the World Gold Council to generate sponsor fee revenue of $72.8 million in 2010, $93.8 million in 2011, and $104 million in 2012. Gold holdings only began exiting the GLD in a significant way in 2013, a downtrend which continued in 2014. In 2013, the average gold holding in the Trust fell to 998 tonnes, and then fell further to an average of 779 tonnes for 2014. As cash and gold flowed out of the GLD in 2013, the sponsor fee took a large hit and fell to $71.5 million for the 12 months to December 2013 from $104 million in 2012. You will also see below that the total sponsor fee for 2014 fell a further 33% to $47.8 million for the year ending 31 December 2014. 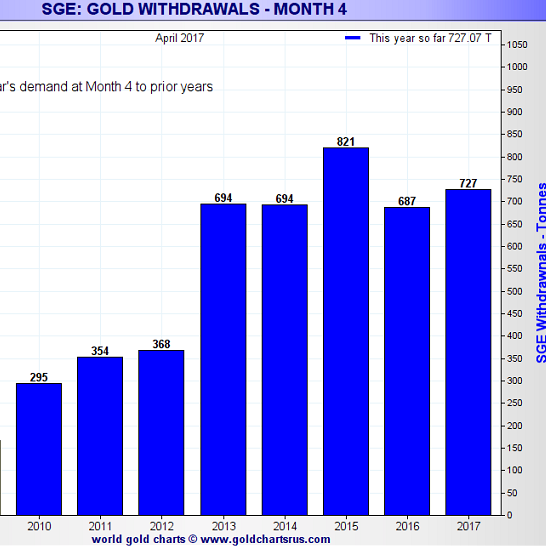 Outflows of cash and gold from GLD continued in 2015, and for the five months from January 2015 to May 2015 inclusive, the daily average amount of gold held in the GLD was 742 tonnes. As of early June 2015, the GLD only holds 708 tonnes of gold, about the same as it held in September 2008. This is why, as mentioned in the introduction, the GLD has now fallen out of the Top 10 ETFs worldwide, by size. Although the World Gold Council has not yet published its 2014 consolidated financial statements, it’s very easy to calculate exactly what the GLD sponsor fees were in 2014 (and also in Q1 2015) because they are published in detail in up-to-date GLD regulatory filings (which are unaudited financial statements). GLD uses a fiscal year from October to the following September, so it has a year-end on 30 September. So, to calculate the GLD sponsor fees between January 2014 to December 2014, all you have to do is subtract Q4 2013 from the full GLD fiscal year figures in its 10-K filings and add Q4 2014 from its 10-Q filing, or else add up four quarters in four of the 10-Q filings. To check that this type of calculation makes sense, we can work out what Jan -Dec 2013 fiscal year sponsor fees would be just using GLD filings data. The GLD sponsor fee for the 3 months to end of December 2012 was $28.006 million. The sponsor fee for the 3 months to end of December 2013 was $13.245 million. (GLD 10-Q for quarter-end Dec 2013) The sponsor fee for the year ended 30 September 2013 was $86.152 million (GLD 10-K for year-end Sept 2013). This $71.391 million is very close to the World Gold Council’s reported sponsor fee figure of $71.479 million for fiscal year January – December 2013. Therefore, the same approach can be used to calculate the 2014 full year figure. 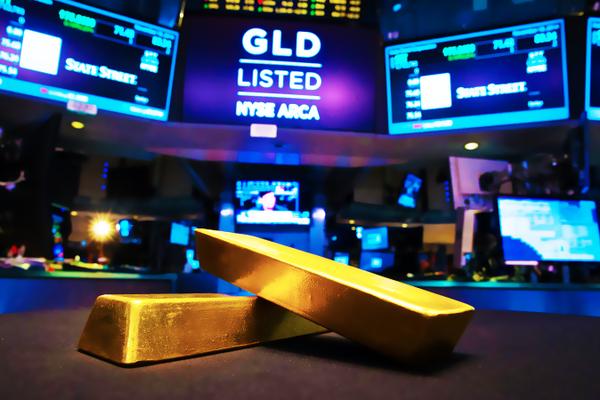 For the year ended 30 September 2014, GLD sponsor fees only totalled $50.148 million (10-K). For the quarter ended 31 December 2013, sponsor fees were $13.245 million (10-Q). For the quarter ended 30 December 2014, sponsor fees were $10.928 million. This produces GLD sponsor fees for the January to December 2014 fiscal year of $47.841 million. Given that the calendar year 2013 GLD sponsor fees of more than $71 million looked very low relative to the comparable full year figure of $104 million in 2012, the 2014 total of $47.8 million looks shockingly low on a relative basis. This is 33% below the 2013 GLD sponsor fee, and a massive 54% less than the 2012 GLD sponsor fee. Which is why the recent consent solicitation by World Gold Trust Services to alter the terms of the trust indenture looks increasingly interesting. World Gold Council total expenditures were running at $84 million for 2010, $108 million in 2011, $117 million in 2012, and nearly $116m in 2013 (so for the 2011-2013 period, expenditures were averaging over $113 million per year). In each of the four years featured in the table, market development expenditures account for roughly half of annual expenditure, with personnel, and general & administrative expenditures comprising the other half. Nearly all sub categories of expenditures within these three main categories have risen sharply in the 2010-2013 period. The strong revenues generated from GLD sponsor fees have most definitely facilitated this huge expenditure increase over 2010-2013. 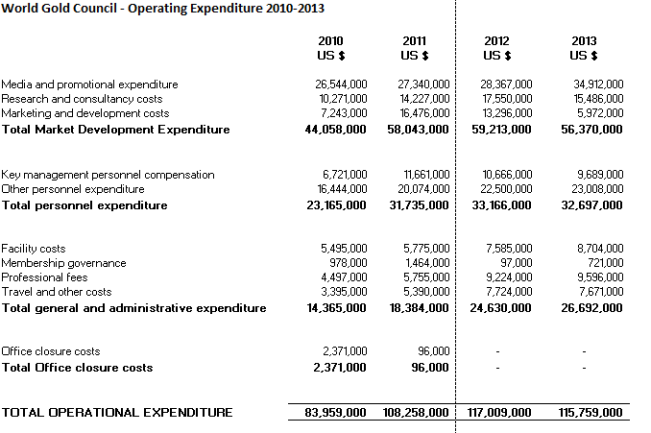 Without GLD, the World Gold Council’s member dues would not have covered even half this expenditure. As an illustration of what the World Gold Council spends on itself, consider the real estate that the World Gold Council occupies. Since the WGC first opened an office in London at 6 Carlton Gardens in 1987, it was moved address quite frequently within central London, always within the plushest of London locations, first to 10 Haymarket in 1991, then to 45 Pall Mall in 2000, then to 55 Old Broad Street in the Square Mile in 2003, and most recently in 2010 to 10 Old Bailey (still in the City of London). To the World Gold Council, image and location seem to be critical. “the office interiors – with their Wenge veneers sitting next to white glass partitions and floating walls – are full of drama. Of course, we couldn’t entirely leave out the gold, but we kept it subtle, with pendant lighting and inlaid carpeting to soften the design”. In other cities around the world, the World Gold Council also maintains offices in some of the most prestigious office towers, such as the 57th floor (near the top) of the Republic Plaza, on Raffles Place in Singapore, one of Singapore’s tallest skyscrapers; the 19th floor of 2 International Financial Centre, Hong Kong island’s pre-eminent landmark; and the 48th floor of the skyscraper at 1717 Nanjing Road in Shanghai. Will 2014 revenues have covered the expenditure trend? If 2014 members’ dues were based on $1 per ounce of gold produced (and so totalled about $30 million), when added to the relatively small 2014 GLD sponsor dues of $47.8 million, and about $4 million in other income, this would only bring total 2014 revenues to about $82 million, the same as the 2010 spend. Members’ dues for 2014 of $2 per ounce would bring in another $30 million, bringing 2014 total revenues up to about $112 million, just short of the average WGC annual expenditure for the three years prior to 2014. Therefore, the WGC may even have raised member dues above $2 per ounce in 2014, for example to $2.50 per ounce of member gold produced. In 2013, WGC Operational Expenses of $115,759,000 exceeded Total Revenue of $103,135,000, causing a deficit in results from Operational Activities of $12,624,000. These deficits ultimately have an adverse effect on the Council’s equity reserves. It will be interesting to see how the revenue to expenses equation pans out for fiscal year 2014 when the WGC’s consolidated financial statements for 2014 are eventually published. The falling gold price in US dollar terms has hit the World Gold Council from all sides. A lower USD gold price has put gold miners into cost cutting mode, and made them more likely to reject higher World Gold Council members’ dues by departing. The lower USD gold price has also undermined the institutional investor base that was a large part of the success of the GLD, and so has undermined WGTS GLD sponsor fee revenue. The WGC’s revenue model appeared at first glance to be one where the Council had essentially full control over members dues and a lot less control over GLD fees. However, in June 2014, World Gold Trust Services moved to exert full control over all of the fees of the SPDR Gold Trust via initiaing some critical changes to the sponsor fee calculation and the GLD trust indenture via a consent solicitation to GLD shareholders. This is likely to see the World Gold Council gain far more revenue from the GLD in the near future. Teeing up these 2 proposals for implementation required amendments to the GLD Trust Indenture. Changes of this nature to the Trust Indenture required 51% of GLD Shareholders to consent, hence the consent solicitation campaign. This 51% threshold was eventually reached on 25 February 2015, after which the consent solicitation campaign was halted. To fully understand the significance of the consent solicitation process that took place between June 2014 and February 2015, and the upcoming changes to the GLD fee structure in the near future, requires an understanding of the GLD Trust Indenture and the GLD Marketing Agent Agreement, as well as an understanding of how the GLD Sponsor and current GLD Marketing Agent are currently compensated versus how they will be compensated in the future. This will also allow a better understanding of the Sponsor’s real (as oppossed to stated) motivations behind the consent solicitation campaign. 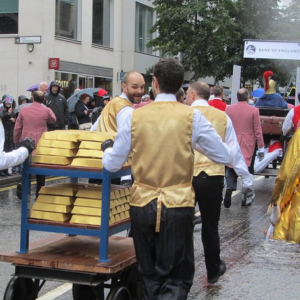 Part 2 of this World Gold Council funding series analyses the GLD Consent Solicitation campaign and further considers the GLD golden goose future fee structure.